Provides amplification, calibration, linearization, and temperature compensation of sensors. MAXIM Integrated Products, represented in Australia by Arrow Electronics , has released the MAX1464, a low-power, low-noise, multichannel, 16-bit programmable sensor signal processor. It provides amplification, calibration, signal linearisation, and temperature compensation. The MAX1464 delivers overall performance approaching the inherent repeatability of the sensor without requiring any external trim components. It accommodates sensors with sensitivities from 1mV/V to 1V/V. It is optimised for industrial, automotive, and process control applications. It is designed for use with range of sensors, including pressure sensing and compensation, RTD and thermal-couple linearisation, weight sensing and classification, and remote process monitoring with limit indication. It includes two 16-bit voltage-output DACs and two 12-bit PWMs, which can be used to indicate each of the temperature-compensated sensor signals independently, as a sum or difference signal, or as a user-defined relationship between each signal and temperature. Uncommitted op amps are available to buffer the DAC outputs, drive heavier external loads, or provide additional gain and filtering. 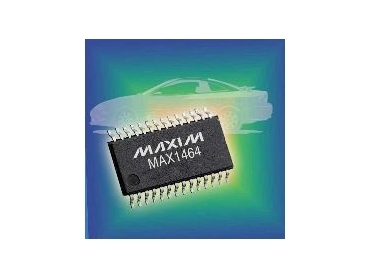 The MAX1464 also incorporates a 16-bit CPU, user-programmable 4kB of FLASH program memory, 128 bytes of FLASH user information, one 16-bit ADC, four rail-to-rail op amps, one SPI-compatible interface, two GPIOs and one on-chip temperature sensor. It is packaged in a 28-pin SSOP package, operates from a single 5V supply and is available for the automotive, industrial, and commercial temperature ranges.